Who doesn’t love a good manicure? It’s a way to feel pampered and a little more put together. Gel manicures are all the rage right now and the polish stays a lot longer than the regular kind. I found a way to supposedly recreate this at home. 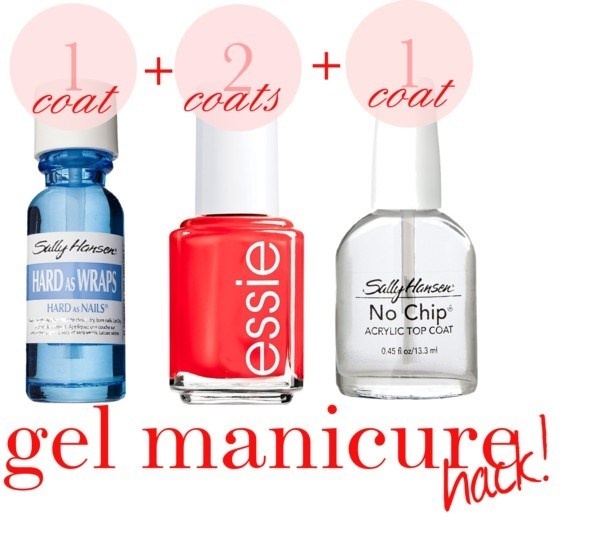 So just like it says in the picture first use one coat of Sally Hansens “Hard as Wraps”, two coats of your favorite nail polish, and one coat of Sally Hansen’s “No Chip”. I haven’t tried it yet, but I definitely will be! Click here to get the full skinny!